WASHINGTON — Senate Majority Leader Mitch McConnell is trying a new health care strategy after the “repeal and replace” measure failed. McConnell says he will push the Senate to pass a clean repeal bill. 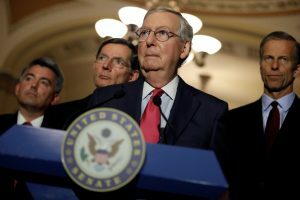 The Republican leader made the announcement in a statement that came a few hours after two Republican senators dealt a fatal blow to the replacement bill unveiled last Thursday, meaning McConnell lacked the votes to move ahead. The vote on the Senate Republican health care bill has been delayed, but the behind-the-scenes battle continues. What key questions could help decide the bill’s fate? Dr. Ezekiel Emanuel of the University of Pennsylvania and Avik Roy of the Foundation for Research on Equal Opportunity join Judy Woodruff to debate different aspects of the proposed legislation. McConnell says that in the coming days, the Senate will consider the House-passed bill, with the first order of business a repeal of Obamacare with a two-year delay. He is not saying when the vote will occur.